To increase your skimmer's maximum water flow from 4,000 gallons per hour on the 6.0 skimmer, to a maximum of 10,000 gallons per hour on the 8.0 skimmer, just change the Weir Plate Assembly from the 6.0 to the 8.0. All of the screws will match up perfectly. The skimmer housing (box) is the same for both skimmers. 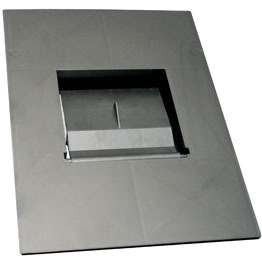 You will need to drain the pond's water level down below the base of the skimmer so you can work with dry materials. Unscrew the 6.0 weir from the front of the skimmer and pull the EPDM liner off of the skimmer's face. Then you will have to remove any remaining black silicone from the liner and the skimmer's face. Take the new 8.0 weir assembly and cut your liner to fit the new 8" opening. Apply a fresh bead of black silicone around the skimmer's face and over the open screw holes. (See enclosed weir plate instructions for more information if necessary) Now attach the 8.0 weir plate with the screws, tighten, and wait 30 minutes before refilling pond water. Now you can increase the size pump up to 10,000 GPH. From Anonymous of Galena, Ohio on 10/31/2012 . From Nick of Pismo Beach, California on 1/27/2012 . 7/30/2012 – My aquascape weir flap is 5 1/2 x 5 1/2 but it has two what I will call tabs to insert into the weir (no screws). Would . . .
7/27/2010 – The raccoons keep destroying the foam that allows the door to float and let in debris but not back out again. According to . . .
5/14/2010 – I need a replacement weir flap. My weir measures 5 1/2" x 5 1/2". Is the 6.0 or 8.0 that size? 7/28/2009 – The door on the weir plate broke and I would like to know if I can just replace the door or do I have to purchase the entire . . .